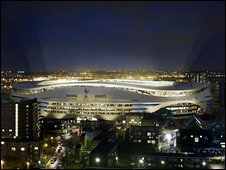 Tottenham Hotspur have unveiled the first images of their proposed new stadium at White Hart Lane. 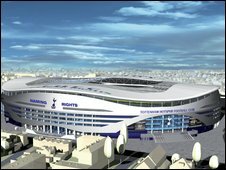 Spurs have not finalised details of the arena but have revealed it would be built alongside the current ground. Tottenham chairman Daniel Levy said: "This design has been described as the first of the next generation of stadia. "This is more than just somewhere where the team can play football. It will deliver investment for the future of the Borough and benefit the community." The architect responsible for the project says the capacity for the stadium will be confirmed within the next month and is expected to be between 55,000 and 60,000. The reconstruction of the site will include a club museum, shops, homes and facilities for the Tottenham Hotspur Foundation. What do you think of the initial plans? And Levy added: "Development projects on this scale take a long time from the initial starting point to final completion. "Any new stadia we have seen recently would have been designed at least eight-to-ten years ago. "It's about leaving a legacy for this great club and, once delivered, I hope all our fans around the world will be very proud. "The brief I gave the architects was to design an iconic stadium that would be one of the best in Europe. "My over-riding priority is to re-create the terrific atmosphere we have at the current stadium, within a world-class stadium that offers state-of-the-art facilities. "This means designing a stadium which has supporters as close as possible to the field of play and not simply looking to chase headline capacity. "Our fans will find themselves closer to the pitch than at any other comparable stadium in the UK. This design puts fan experience first. "In addition to the stadium, we are designing great facilities that will add to the local environment and can play a role in the regeneration of the wider area."